Looks as if it’s game on — Trump versus the Deep State. “Deep State” is a term that originated in Turkey to describe certain actors within the structure of government who were unseen but who wielded the real power irrespective of who won elections. A few years ago, a retired congressional aide named Mike Lofgren appropriated the term to describe a similar phenomenon here in the United States. Others, including Agora founder Bill Bonner, find it a useful prism through which to view the passing scene. As you’re likely aware, President-elect Trump has expressed skepticism about the “Intelligence Community” and its claims that Russia “interfered” in the 2016 campaign for purposes of electing Trump. And then there’s Trump versus the Deep State’s most powerful economic cell — the Federal Reserve. Yesterday afternoon, the Fed released the “minutes” from its meeting last month. While the name “Trump” appeared nowhere in the document, it nonetheless conveyed a veiled threat. Translation from Fed-speak: If Trump cuts taxes, we’re jacking interest rates even higher than we’ve already said we will. Recall that during the campaign, Trump declared he would fire Janet Yellen as Fed chair — although the president possesses no such power. “Trump also claimed that Yellen was keeping interest rates artificially low in order to pump up the stock market and help elect Hillary Clinton,” Jim reminds us. Yellen began to strike back at her press conference right after the December Fed meeting. As Jim pointed out the day after, she said she might stick around on the Fed Board of Governors even after her term as chair is over in early 2018 — a lingering thorn in Trump’s side. But she also hit out at Trump’s economic plan. When it comes to “stimulus,” Yellen is fond of tax credits for education, worker training and certain infrastructure. Across-the-board tax cuts that would most benefit the wealthy? Not so much. Seen in this context, yesterday’s Fed minutes could be a way to turn up the heat on Trump: Yo, Mr. Big Talker, you wanna cut taxes for the rich? We’ll just ratchet up interest rates some more. We’ve been all about easy money these last eight years, but we’re gonna choke off “Trumpflation” at the first sign of it, bub. Remember who’s in charge here! But what if the economy doesn’t run hot, despite the Trump stimulus? In addition, Jim says, “It will be difficult for Republicans suddenly to become the party of big spending and higher debt ceilings without extensive criticism from the Democrats, the media and parts of the Republican base. Increased spending is in the cards, but it may be far smaller than both Trump and the markets expect. “In short, the Trump ‘stimulus’ may turn out to be far smaller and far less stimulative than markets currently anticipate,” Jim concludes. In the meantime, other elements of the Deep State will continue their own scheming. The International Monetary Fund convenes its next big meeting on April 21 — at the very time Trump’s first-hundred-days agenda would be hitting the wall. Then what? Jim spins out the scenario in the rest of his 2017 forecast when you click here. To the markets, where gold is the standout performer: It began climbing steadily in Asian trade overnight, and it continues to climb today. At last check, the bid was up to $1,183 — nearly $20 higher than at this time 24 hours ago. Sure enough, the dollar index has backed off big-time this week — from a 14-year high of 103.8 Tuesday to 101.4 as we write. In the meantime, stocks are taking a breather: The Dow has shed 100 points, to 19,840. CNBC is attributing the move to “uncertainty surrounding Trump policies” — which sounds to us like affirmation of Jim’s thesis that the Trump Trade has gotten ahead of itself. Like gold, Treasuries are benefiting from an influx of hot money: Prices are rising and yields are falling. The yield on a 10-year note is down to 2.37%, a four-week low. Crude’s been up, down and all around this week. Right now a barrel of West Texas Intermediate fetches $53.34. Yes, we’ve reached “Peak Auto” for the post-Panic of 2008 era. No, this is not a repeat. On Dec. 22, we took note that each of Detroit’s Big Three is idling some factories during January. Some of that is a function of overproducing sedans and minivans at a time when fuel prices are still relatively low and consumers would rather splurge on SUVs. But we also suggested nearly everyone who’s needed to buy a vehicle these last eight years has done so by now. Yesterday, the automakers released final sales figures for 2016. It’s another record: All told, 17.55 million vehicles left the lot — up a skootch from the previous year’s 17.48 million. Last month was one of the strongest Decembers on record… but that’s because of discounts amounting to an average $3,542 per vehicle, according to J.D. Power. That’s about 10% off the original asking price — something unseen since, well, the onset of the Panic of 2008. “The blood thinner market is expected to grow into a $9 billion per year pharmaceutical business,” says Ray Blanco on the science-and-wealth beat. Late last month, a company Ray’s been watching throughout 2016 submitted a New Drug Application for a blood thinner to the FDA. The FDA was suitably impressed: Not only did it accept the application, it granted “Priority Review” status. That means “it will work speedily to decide whether or not it should be allowed to enter the health care market. Priority Review drugs are generally decided upon in a period no more than six months from the date of the FDA accepting the application.” Thus, Ray expects an FDA decision no later than June 24. Nor is that the only “magic date” on Ray’s calendar. In fact, there’s one coming up at the end of the month — with the potential for a 50% gain in a matter of weeks. Follow this link to learn more. “In response to the comments on the future of gold,” a reader writes, “one should use today’s prices as a buying opportunity, not a reason to sell. “What we have today is a marketplace being heavily influenced by the actions of those in government and at the central bank. This has been apparent since 1987 and even more so in the last eight years. You don’t double-down on your debt without affecting most everything else. “There are also two major events in the history of our country that show how government is heavily concerned about the price of gold. In 1933, FDR confiscated almost all the gold in the USA, leaving a few coins to be held by the citizens. Then in 1971, Nixon removed the option to convert dollars to gold, done by foreign central banks, to maintain what was left in the country’s national reserve. “Here is why this should matter to those in the USA. During the reign of the U.S. dollar as the world reserve currency, anyone living in a country outside the USA would have done very well to preserve their wealth in gold, relative to their own currency. 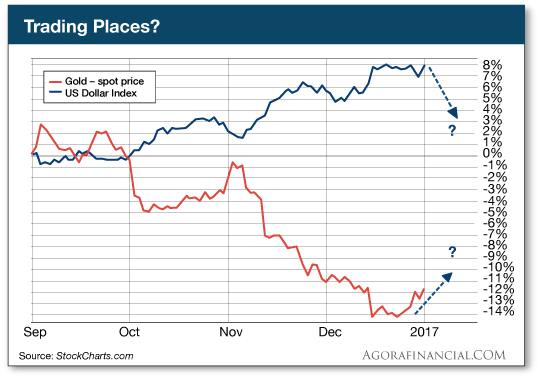 Now in 2017, we see the rest of the world slowly moving away from the U.S. dollar to conduct trade. There will be a tipping point one day, and it doesn’t look to be that far off, when the dollar’s use in world trade falls below 50%. Then the dollar will have a problem and gold will see big moves as priced in U.S. dollars. P.S. Jim Rickards recently alerted us to an urgent gold opportunity: Starting just weeks from now, a tiny company trading for just $9 per share… is poised to begin unleashing $638.1 million worth of ultra-rare gold. Gold so rich… so valuable… that it’s 15x the concentration of the average gold mine. A similar situation could’ve handed early investors… who got in and held on… a historic 5,379% gain. Don’t miss this. Click here for the urgent details.